Natural looking extensions are a practical, convenient, and beautiful alternative to the daily use of mascara. 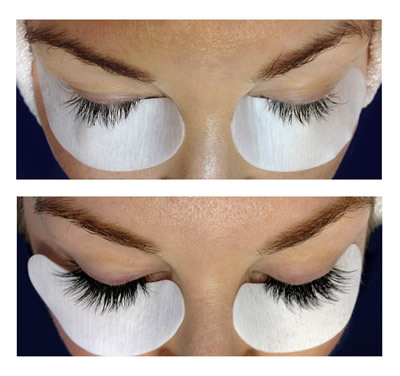 These extensions lengthen and thicken your natural lashes for a glamourous result! Unlike most other brands, Blue Water Spa’s lash extensions dry as a deep, glossy black for an effortlessly polished look. Comprised of a wide-ranging palette of shapes, textures and sizes of eyelash extensions that can be combined for looks that run the gamut from subtle and natural to trendy and glamorous; each lash application is a work of art with an intricate finish. Your Blue Water Spa licensed medical aesthetician will work with you to determine the best lash extensions for your lifestyle. Blue Water Spa has worked with the top eyelash providers in New York and California to offer the finest in lash extension services to our clients. Blue Water Spa has obtained the highest quality product and elite training. Blue Water Spa’s aestheticians are instructed with the industry’s most comprehensive, physician-developed training course for the most efficient and effective application techniques. The application of eyelash extensions is a highly technical and meticulous process, requiring well-trained professionals to safely perform the service for optimal results. The lash extensions used at Blue Water Spa last two times longer than the leading competitor. They are waterproof, oil-proof, and flexible leaving you with beautiful lasting results. Lash Extensions at Blue Water Spa are a glamorous new way to extend the length and thickness of natural eyelashes, and are a practical, convenient and beautiful alternative to the daily use of mascara. Unlike decades-old, traditional false lashes, lash extensions are the first innovation in lash lengthening that can be worn daily, without nightly removal. Because each tapered, synthetic lash is bonded to a single natural lash, the final result is effortless glamour that is difficult to detect, even close up. When properly applied with the medical grade adhesive that Blue Water Spa has chosen, lash extensions can be worn throughout the year with minimal monthly maintenance. Touch-ups are recommended after the initial full set application to refill any lashes that have cycled out. To maintain the full, thick appearance of a new set of lashes follow up visits are recommended every 3-4 weeks based on your own natural lash growth cycle. Blue Water Spa uses long-lasting, physician developed, medical-grade lash extension adhesive. Blue Water Spa’s lash products are all scientifically formulated, ophthalmologist tested, and glycol and carbonate-free. When applied properly, lash extensions will not harm natural lashes. Our application technique allows natural lashes to grow and thrive with extensions. 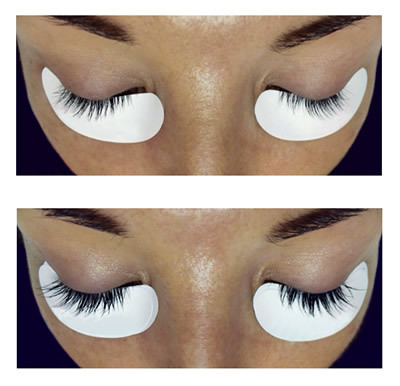 This technique requires several different “separation” steps during the application process so each extension is adhered to a single natural lash in order to prevent interruption of the lash growth cycle. True lash extensions are single fiber artificial eyelashes with a tapered tip and blunt base. They are intended to be applied one at a time to one single natural eyelash hair. When applied properly, extensions do not have the opportunity to cause damage to the natural eyelashes. They grow, rest and shed right along with the natural eyelash to which they were applied, so there is no damage to neighboring eyelashes. Mascara is typically not needed with lash extensions. Mascara should only be used when a touch-up is drawing near. Water-soluble mascara can be worn; however constant use of mascara may shorten the lifespan of lashes. Waterproof mascara is not recommended for use, as it will dissolve the bond with the lashes. Blue Water Spa offers a glycol and carbonate-free mascara that is specifically formulated for use on extensions without interfering with the adhesive. Once Applied, What Is The Proper Way To Care For Lash Extensions? Nightly conditioning is necessary to maximize the life of the extensions. Blue Water Spa offers nighttime conditioning/cleansing pads that are perfect for cleaning the lashes of any makeup or debris while moisturizing the lashes to maintain flexibility. Using a lash wand to comb the lashes free of tangles is also recommended. You shouldn’t leave a hair salon without top of the line hair products – same with your lashes!